Hi all! Linking up with Fine Linen and Purple again today. I've been thinking about clothes and scouring Pinterest lately - for the very specific reason that in a month's time I will be doing a talk (more on this later)...in front of more than 2 people...and I'll be sweating....profusely. No wait, ladies don't sweat, they perspire. So I will be perspiring profusely and I am looking for an outfit that will hide the fact that I'll have two little faucets going full blast under my arms. I'm thinking this isn't the outfit for the talk, but I'm still not sure. This little ensemble is (again) almost completely thrifted. Stripy shirt is some weird label...but hey, I like it because it's long in the front and back and it's stripy. The necklace - Oh the necklace - was bought from Target FULL PRICE but I loved the colour so much I couldn't help myself. What do you think? 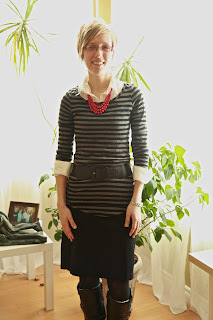 Good public speaking outfit - bad public speaking outfit? Extremely pretty silhouette. Doesn't hurt that you are slim as can be! 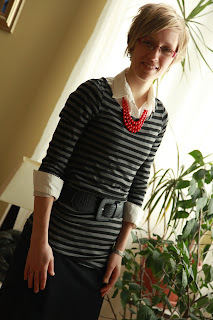 The stripes look fun and the belt made me realize that I could've used one today. And sometimes you just need the necklace. Good choice! The red necklace totally makes it! I think it's a good public speaking outfit: conservative, but still shows that you have a personality. Here I am all this time thinking that ladies didn't sweat or perspire but glowed...what do I know. In any case you should not hesitate wearing what you are wearing in the photo. It looks great! I think it's a fabulous public speaking outfit. Bold with a pop of color. You look professional and put together. Love it. The outfit works great for public speaking, for appearance's sake, but were you comfortable? That's the true test. It looks comfy to me. Plant? What plant? I do admire your fascinator though. I love the WIW posts... maybe one day I'll actually do one. Such a cute outfit.